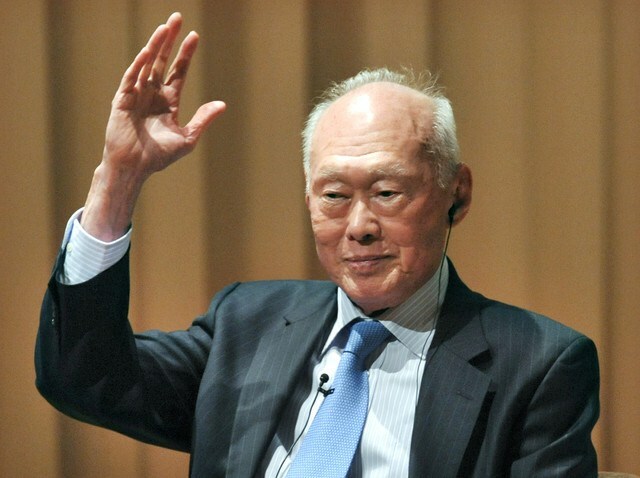 Mr Lee Kuan Yew passed away at the age of 91, on 23 March 2015. 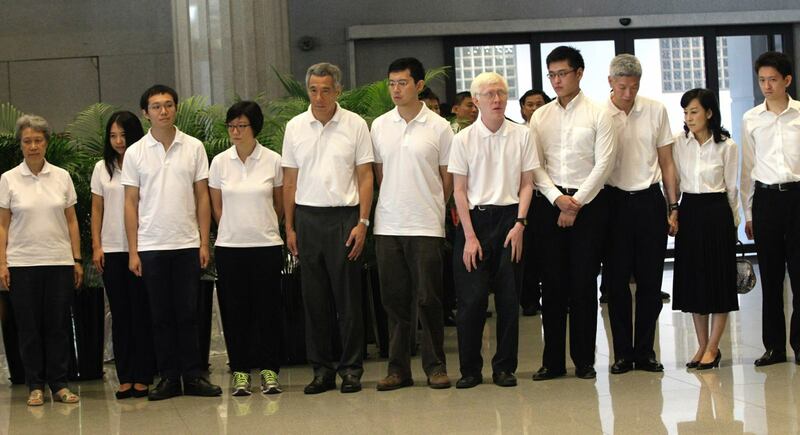 But his contributions to Singapore will forever be etched into our nation’s history. Read our story on the 91 things we’ll remember about him and his life story here. Mr Lee Kuan Yew suffered from slight dyslexia, though his condition didn’t deter him from achieving unrivalled success in the region. He attended Telok Kurau English School before moving on to Raffles Institution, where he secured a scholarship to attend Raffles College. He graduated from Cambridge University and read law at Fitzwilliam College. 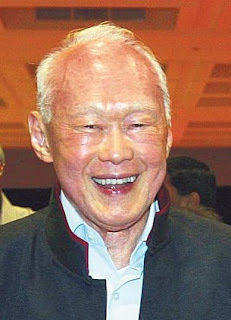 LKY was the first Prime Minister of Singapore and served from before Singapore’s independence in 1959, till 1990. 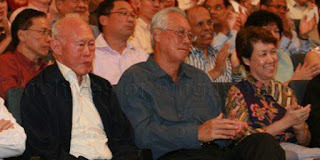 He also served the Tanjong Pagar constituency for nearly 60 years as a Member of Parliament. 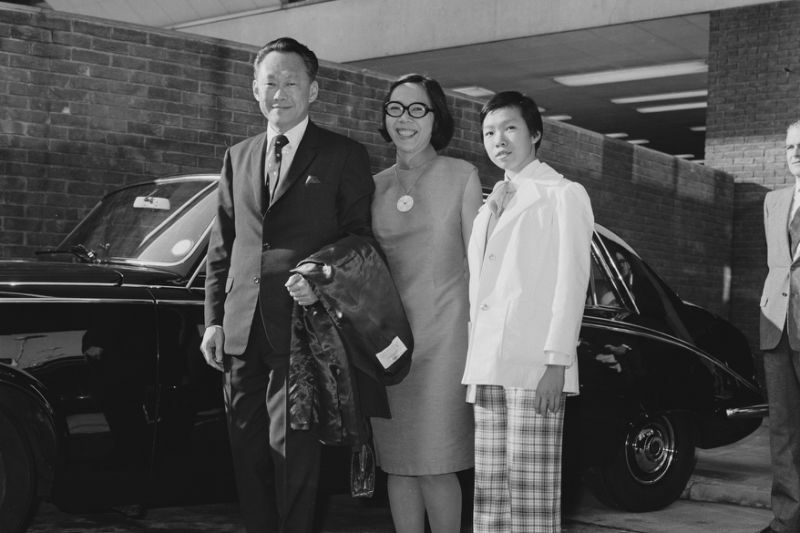 He was the man who transformed Singapore from a third-world country to a bustling first-world metropolis, with international media such as BBC in awe at how LKY engineered Singapore’s miraculous economic transformation. Leaders worldwide recognized his contributions with Japanese Prime Minister Shinzo Abe referring to him as “one of the greatest leaders of modern times that Asia has produced”. He was duly awarded the Grand Cordon of the Order of the Paulownia Flowers — the highest honour for foreign leaders conferred by the Japanese. Behind every successful man there stands a woman. And for LKY, that woman was none other than Madam Kwa Geok Choo. 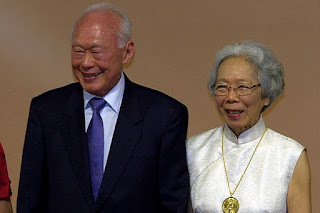 She and LKY got secretly married in England, 1947 before remarrying in Singapore in 1950. 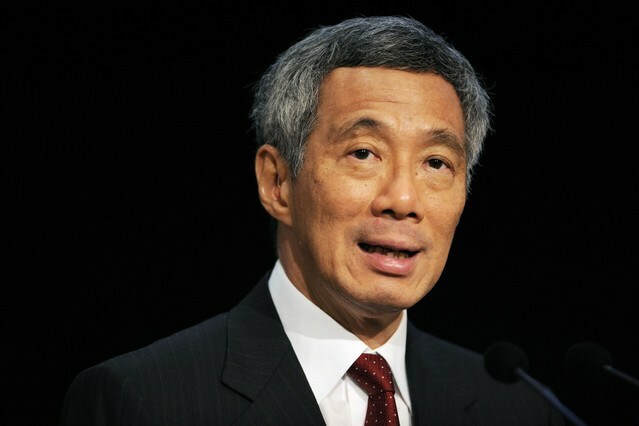 She gave birth to three children: Lee Hsien Loong, Lee Hsien Yang and Lee Wei Ling. 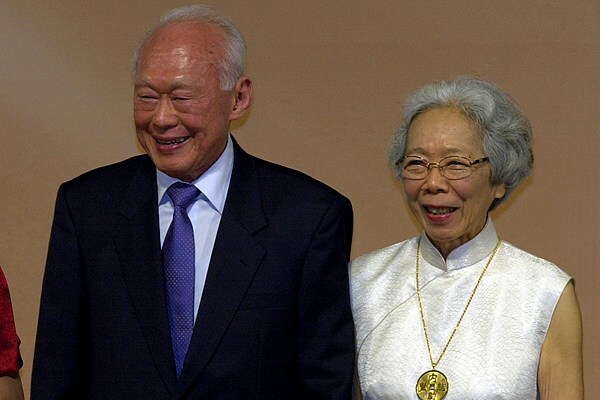 But she wasn’t just a wife — she was a pillar of strength, confidante and advisor to LKY. You can read their love story here. Just like LKY, Mdm Kwa studied at Raffles College, and was the sole female student in the distinguished institution. The two often vied for top spot in the school, and their competition of sorts blossomed into romance. She studied law at Girton College in Cambridge University — where she graduated as a Queen’s Scholar from Malaya. Together with her husband, the two founded the Lee & Lee law firm. 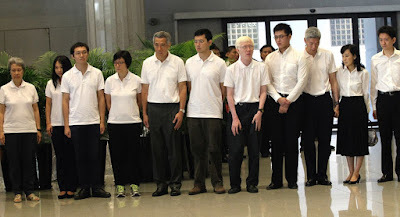 PM Lee is the eldest son of LKY and Mdm Kwa. He got married to his first wife, Dr Wong Ming Yang 黄名扬 and had two children with her — a son and a daughter. Sadly, she passed away in 1982 of a heart attack, reported The Straits Times. He followed in his parent’s footsteps and graduated from Trinity College, Cambridge University. He was a Senior Wrangler — one of the greatest attainable intellectual achievements in Britain. But he didn’t stop there. 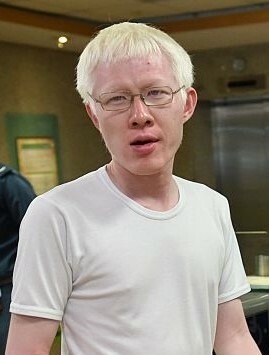 He earned himself a Diploma in Computer Science from Cambridge and a Master of Public Administration at Harvard’s Kennedy School of Government. 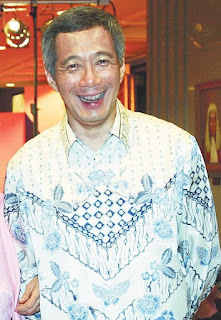 Prior to his involvement in the political scene, PM Lee served in the Singapore Armed Forces from 1971 to 1984 where he was promoted to brigadier-general. He took over from Mr Goh Chok Tong as Prime Minister in 2004, after serving under him as Minister For Trade and Industry, Minister for Finance and Deputy Prime Minister. He is also currently heading the PAP team in the Ang Mo Kio GRC. 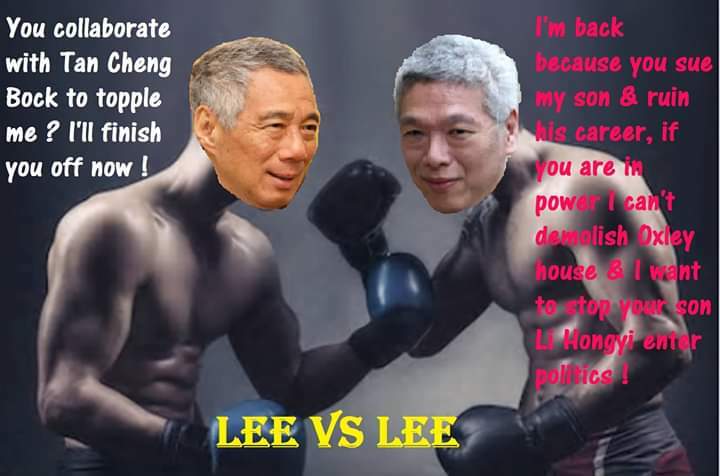 Read our story on how PM Lee and his father fare against each other in a head-to-head comparison. Ho Ching first met PM Lee whilst working at the Ministry of Defence. The pair got married in 1985 and have two sons, in addition to an eldest son and daughter from PM Lee’s first marriage. In 2016, Forbes magazine listed her as the 30th most powerful woman in the world. 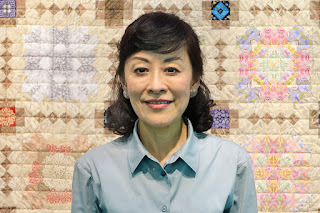 Ho Ching was named Student of the Year after becoming one of the top students of her cohort while at National Junior College. She graduated from NUS with first-class honours in Electrical Engineering and obtained her Masters of Science (Electrical Engineering) from Stanford University. She started out as an engineer in the Ministry of Defence in 1976 and has held positions such as Director of Defence Materiel Organisation and Deputy Director of Defence Science Organisation. She moved on to Singapore Technologies in 1987 and became its President and CEO in 1997. 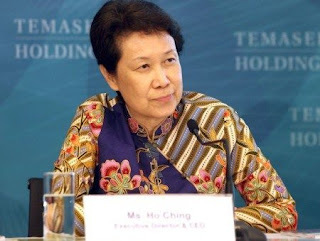 Since 2002, Ho Ching has been the CEO of Temasek Holdings. Dr Lee Wei Ling is the younger sister of PM Lee and elder sister of Mr Lee Hsien Yang. At 62-years of age Dr LWL is still single and has given reasons for her choice. She served as LKY’s personal doctor as mentioned by PM Lee in his private eulogy speech for his father, and was her father’s close companion. Read our story on Dr LWL’s view on healthcare here. Like her other siblings, Dr LWL is a President Scholar. Dr LWL is a neurologist and former director and senior consultant of the National Neuroscience Institute. She used to write for The Straits Times from 2008 to 2009, but left when she claimed the editors didn’t allow her to exercise her freedom of speech, reported AsiaOne. 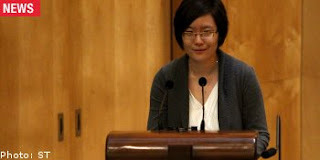 She also wrote a book, entitled “A Hakka Woman’s Singapore Stories”. 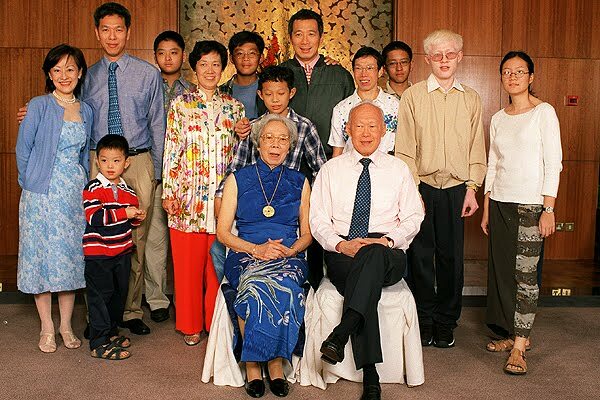 LHY got married to Lim Suet Fern and they have three sons. The youngest of the three siblings, LHY graduated from National Junior College and was awarded the President’s Scholarship and Singapore Armed Forces Overseas Scholarship. Another graduate from Cambridge University, he obtained a double first in Engineering Science and has a Masters of Science in Management from Stanford University. Just like his elder brother, LHY rose through the ranks in the Singapore Armed Forces and became a brigadier-general. 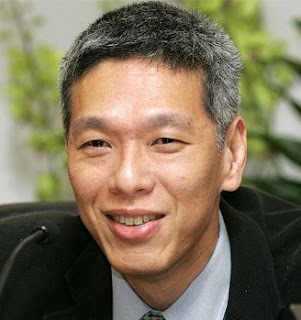 He was the CEO of Singtel from 1995 to 2007. From 2007 to 2013, he was the Chairman of Fraser and Neave. 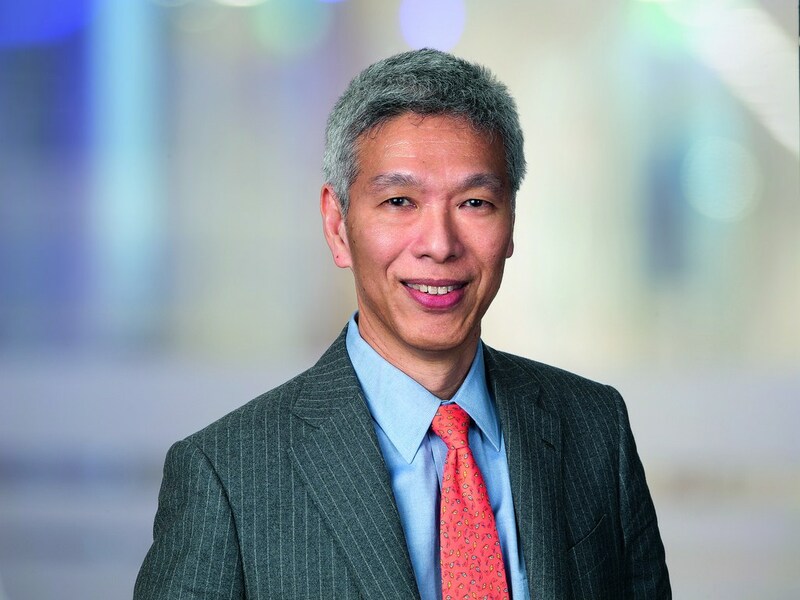 LHY is the current Chairman of the Civil Aviation Authority of Singapore (CASS). 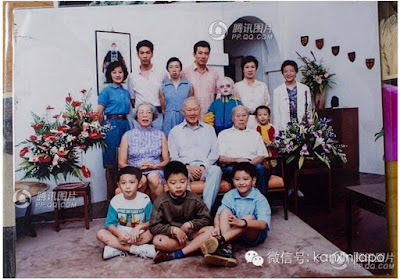 LSF has three children with LHY: Li Huanwu, Li Shengwu and Li Shaowu. LSF undertook Law and graduated from Cambridge University in 1980 with a double first, just like her husband. The 59-year-old is currently the Managing Partner of Morgan Lewis Stamford LLC, a leading Singapore-based regional law firm. She has served on the boards of publicly listed companies all over the world, including Hong Kong and New Zealand. She was also formerly the President of the Inter-Pacific Bar Association. Li Hongyi is the second son of PM Lee and Ho Ching. He has expressed that he has no interest in politics. He was from Rosyth Primary under the Gifted Education Programme. He moved onto Anglo-Chinese School (Independent), Raffles Junior College and Massachusetts Institute of Technology (MIT). 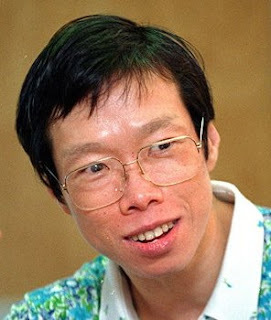 He won the Lee Kuan Yew Award for Math & Science in the year 2006. The 30-year-old worked for Google USA as a Product Manager. 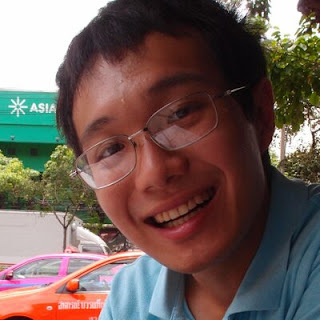 He is currently working for Info-communications Media Development Authority of Singapore (IMDA). Here are 12 facts about Li Hongyi that you never knew. Li Shengwu has publicly backed his father (Lee Hsien Yang) and aunt’s (Lee Wei Ling) claims on Facebook. He believes news in Singapore is heavily controlled by the government and he’s said “…my immediate family has been increasingly worried about the lacks of checks on abuse of power”. 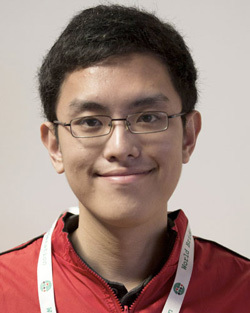 Li Shengwu is a student alumni of Raffles Junior College, where he represented Singapore at the 2003 debate world championships. 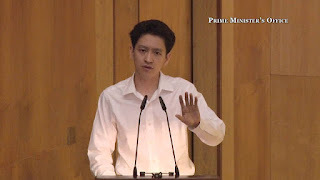 His passion for debate saw him beat 700 others to the “Best Speaker” award at the 2010 World Universities Debating Championships. He topped his class in the Politics, Philosophy and Economics (PPE) at Balliol College in Oxford and pursued a Masters in Economics at Oxford’s Kebel College. His PhD was from Stanford University. He has been a Junior Fellow at Harvard Society of Fellows since 2016. Read our story on 12 Ling Shengwu facts you never knew about. 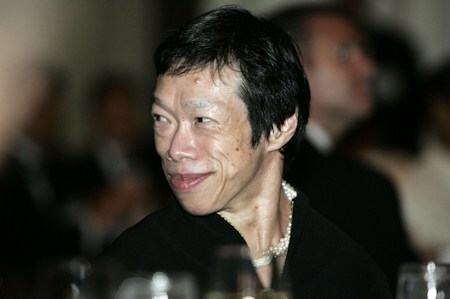 Lee Chin Koon (b. 1903 Semarang, Indonesia–d. 12 October 1997 Singapore) was a storekeeper and depot manager for the Shell Oil Company, and father of Singapore's first prime minister, Lee Kuan Yew. Early life and education - Lee was born in the Indonesian town of Semarang to Lee Hoon Leong and Ko Liem Nio. 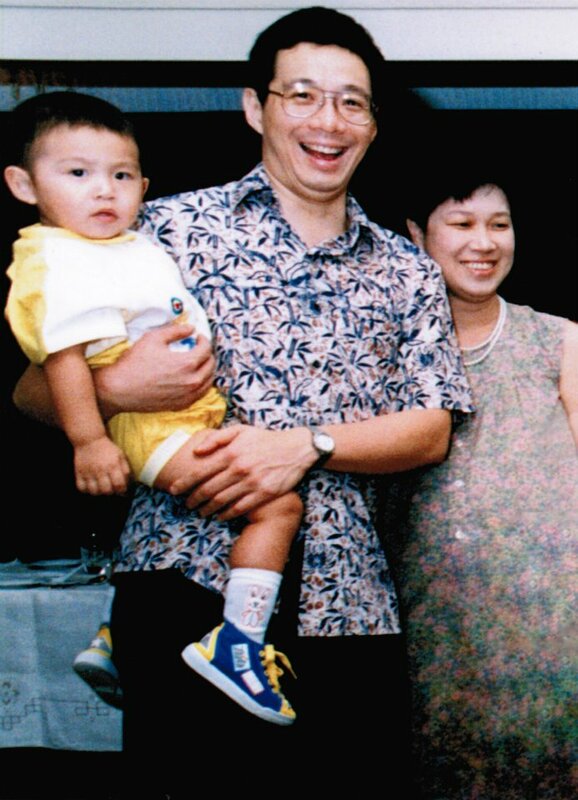 When Lee was a baby, his parents took him to Singapore, where his father, Hoon Leong, hailed from. He was educated at St Joseph's Institution, and left school with a Junior Cambridge Certificate. Lee’s father worked as a dispenser after leaving school, and later became a purser with the Heap Eng Moh shipping line owned by tycoon Oei Tiong Ham. 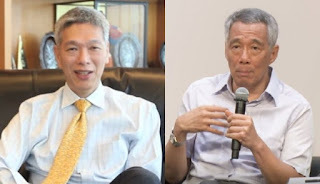 Before long, Lee having gained Oei’s trust and confidence, was accorded power of attorney over the tycoon's assets in Singapore. Lee recalled his childhood in a wealthy family, and a time when he was allowed a "limitless account" at Robinsons and John Little, two high-end department stores in Raffles Place. However, the Great Depression in the late 1920s, and early ’30s hit the family hard, and their fortunes suffered. 11 outstanding Singaporean women past and present will be inducted to the Singapore Women's Hall of Fame (SWHF) Friday evening (March 27) at a gala dinner to mark International Women's Day which fell on Mar 8. 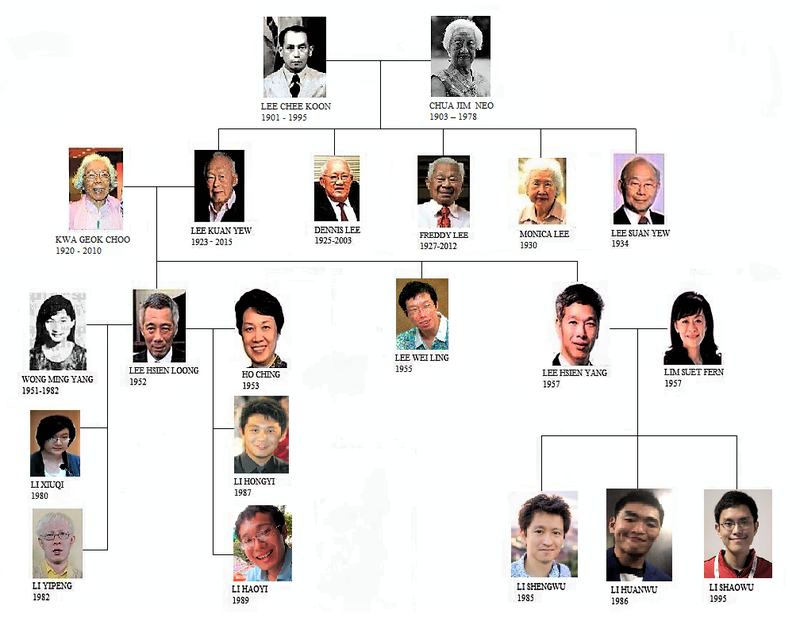 One of the posthumous honourees include Mdm Chua Jim Neo, mother of Singapore's founding father, Mr Lee Kuan Yew. Mdm Chua, better known as Mrs Lee Chin Koon, wrote her definitive Mrs Lee's Cookbook in 1974 when she was 67 yrs old. Mdm Chua decided to produce a cookbook so that future generations would know about the intricacies of Peranakan cuisine. She was just 15 when she wed Mr Lee Chin Koon in an arranged marriage. In his memoirs, her eldest son, the late Mr Lee wrote: "She had been married off too early. Had she been born one generation later and continued her education beyond secondary school, she could easily have become an effective business executive." 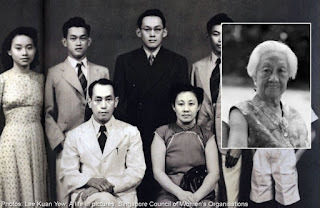 As we prepare for the National Day festivities, let’s take a moment to remember a lady who in many ways is responsible for the Singapore we know today. 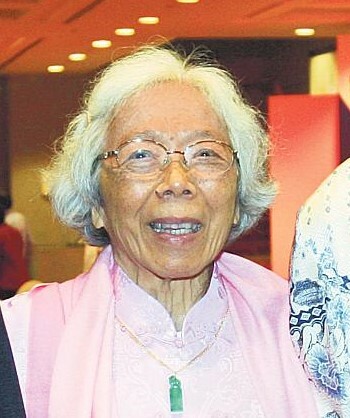 She is the late Madam Chua Jim Neo, founding Prime Minister Lee Kuan Yew’s mother. Mdm Chua passed away on 8 August, 1980, at the age of 73. 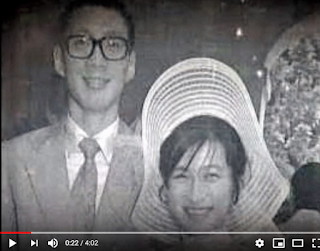 Here are 8 interesting facts about the woman that give us a glimpse into not only Mr Lee’s life, but as well as the Singapore of yesterday. 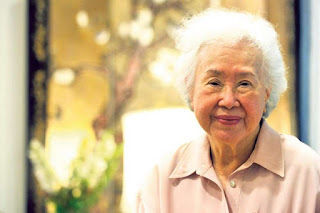 Chua Jim Neo, better known as Mrs Lee Chin Koon, wrote her definitive Mrs Lee’s Cookbook in 1974 when she was 67 years old. 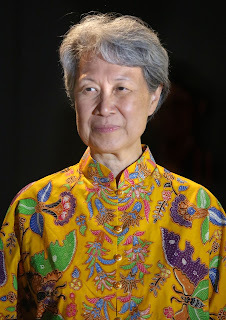 At an age when many women of her generation were content to play with their grandchildren, Jim Neo decided to produce a cookbook so that future generations would have access to the intricacies of the Peranakan cuisine. The book, reprinted many times, is considered one of the most authoritative on Peranakan cuisine in Singapore. Born in 1907, Jim Neo was the eldest child of Neo Ah Soon and wealthy Hokkien businessman Chua Kim Teng from Pontianak in Dutch Borneo. 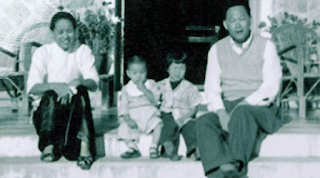 At age 15, she married Lee Chin Koon, a storekeeper, in an arranged marriage. She had five children, a daughter and four boys, the eldest of whom was Kuan Yew, who became prime minister of Singapore in 1959. 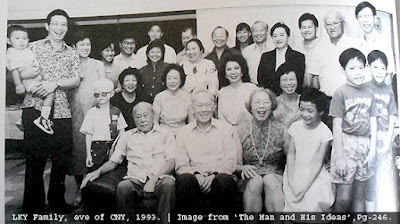 Family Portrait Mr Lee Kuan Yew (in black) in a family portrait the night before he left for England for further studies. 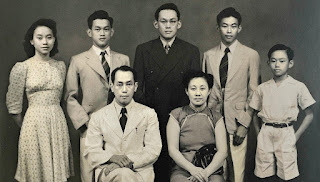 Clockwise from left, Mr Lee's siblings Monica, Dennis, Freddy and Suan Yew, his mother Chua Jim Neo and father Lee Chin Koon. One of my mother's favourite stories of LKY was about the time she taught him his ABCs. In those days, colourful alphabet toys were not available, so my mother made her own by cutting out letters from The Straits Times' headlines. She said she showed the alphabet to LKY only once and when she shuffled the letters, my brother - who was just a few years old - managed to put all the letters back in the right order. 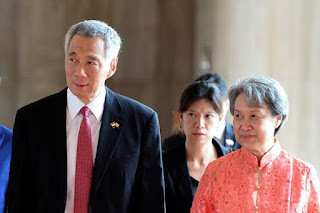 But others who interacted with him caught glimpses of the private man away from his public persona as Singapore's hard-driving, straight-talking first prime minister. At home, he was ever the devoted son who cared deeply for his mother, Chua Jim Neo, even if he upset her once by cancelling her driving licence when he decided she had become too old to drive. While news of Mr. Lee Kuan Yew’s passing was spreading like wildfire on the Internet in Singapore, all was peaceful at Shun De Foshan, China. A 98-year-old lady, Mdm Ouyang Huan Yan, who was Mr. Lee’s former nanny, was oblivious to his demise until she was contacted by a reporter for an interview. 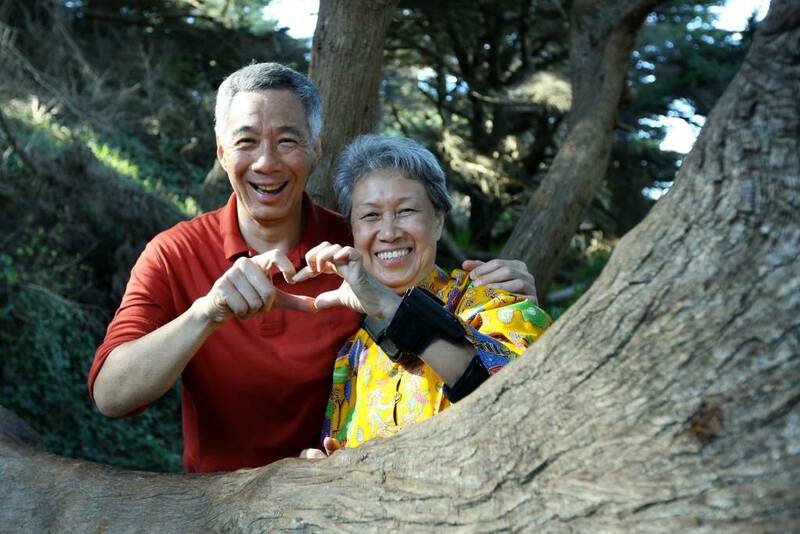 Upon hearing the news, she said her heart felt heavy and that she hoped PM Lee Hsien Loong and Lee Hsien Yang would take care of their health and not be too grieved. Ouyang was an 18-year-old when she left her home in Xixi village, Guangdong province in 1934 with her sisters and aunts. They were known as ma jie, amah or zi shu nu – women who took celibacy vows to better serve their masters. 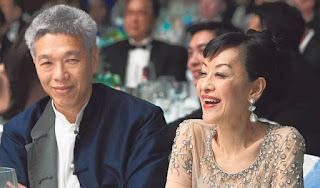 She first worked for Tan Kah Kee, a Chinese businessman and philanthropist, for nine years, before working for the Lees as Mr. Lee’s mother, Chua Jim Neo, took a fancy to her. 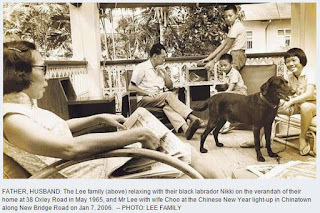 The two families were neighbours then, with Ouyang frequenting the Lee’s since her friend was a domestic helper in the Lee’s. 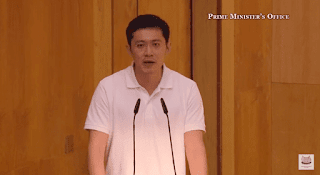 Loong’s late wife Ming Yang died of a heart attack three weeks after delivering the baby. I had just returned to Boston then after passing my MRCP (UK) examination, when my father phoned me to tell me that Ming Yang had died. I flew home immediately, and stayed for a month. Then I returned to Boston to continue my training in paediatric neurology. 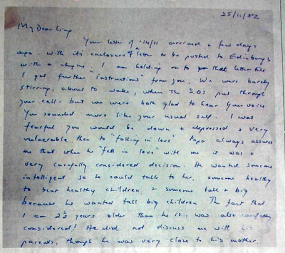 Recently, while clearing some papers, I came across old letters exchanged between my mother and me from that period. They speak of a sad time in our family, of persisting despite everything, of keeping faith with the fundamentals. Below I reproduce a letter from my mother to me, dated Nov 25, 1982, and my reply, dated Dec 7, 1982. 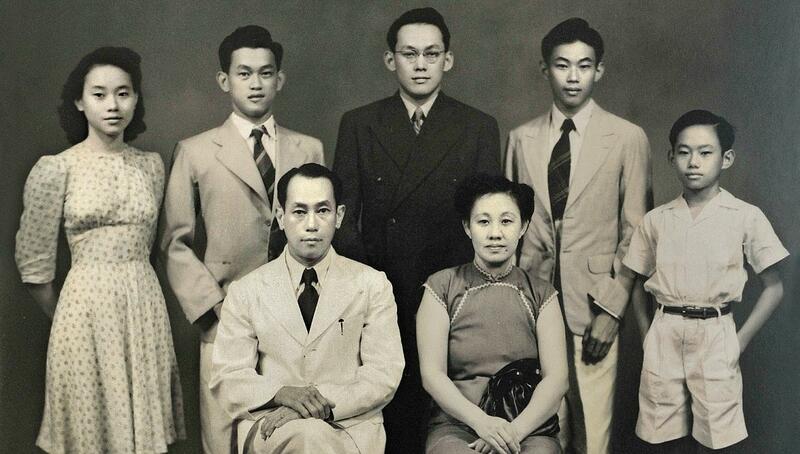 In 1945, Madam Ouyang Huanyan found employment as a housekeeper with a Lee family. 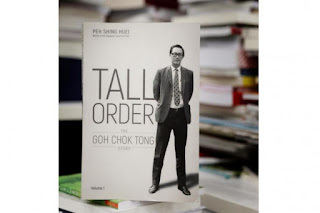 Never did she expect the eldest son of the family to eventually become the Prime Minister of Singapore. 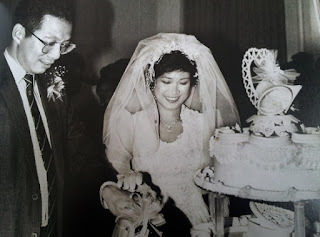 She also witnessed the wedding of Mr Lee Kuan Yew and Madam Kwa Geok Choo, his classmate from Cambridge University. It was a simple affair where relatives were invited to dinner. This anecdote and others are published in a book titled Zishu Nu From Shunde, by China Women Publishing House in 2006. It features the history and stories of Madam Ouyang and other women who left China to work as housekeepers and nannies in South-east Asia in the early 1900s. They all came from the Shunde district in Guangdong province. The book came to the attention of National Neuroscience Institute chief Lee Wei Ling recently. Dr Lee, Mr Lee's daughter, told The Sunday Times that a friend had chanced upon the book while visiting a village in China. In one of the chapters, Madam Ouyang, now 91 and still healthy (see box below), recounted her life in Singapore. I understand that political spouses have a certain role to play alongside their husbands or wives who are politicians. They are on hand to formally greet dignitaries and provide social support. This role however is ceremonial at best. It has no official capacity. After the initial greetings and pleasantries which are photographed, these spouses usually retreat when actual discussions commence. 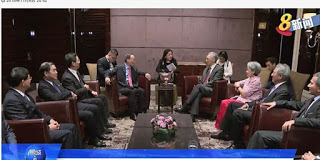 It therefore comes as a surprise that wife of Prime Minister Lee Hsien Loong (PM Lee), Ho Ching was reported to have joined PM Lee, Deputy Prime Minister Teo Chee Hean, China's Vice President Wang Qishan together with other Singapore ministers and officials, as the group sat down to discuss various issues. While Ho Ching, as head of Temasek Holdings, is a powerful woman in her own right, it still remains that she has no official governmental role. In that regard, her presence at governmental discussions may be misplaced. Instead of sitting down to join the group in their discussions, shouldn't she have left after the initial greetings? 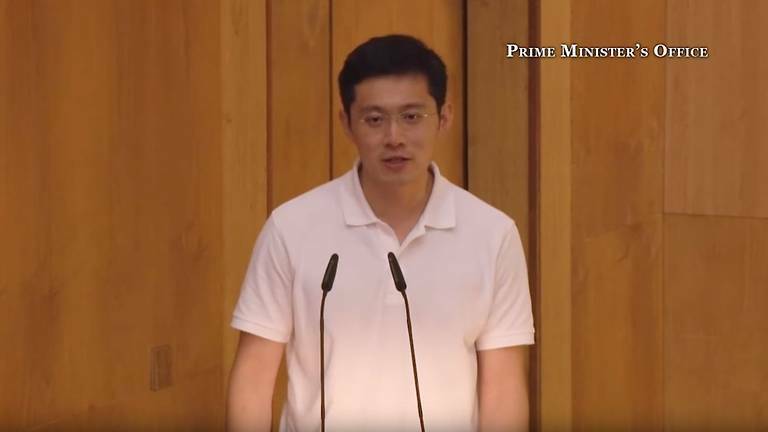 A police report has been lodged regarding videos taken of Prime Minister Lee Hsien Loong’s son, Mr Li Yipeng, who was offered a ride in a private car driven by a 31-year-old Singaporean man. 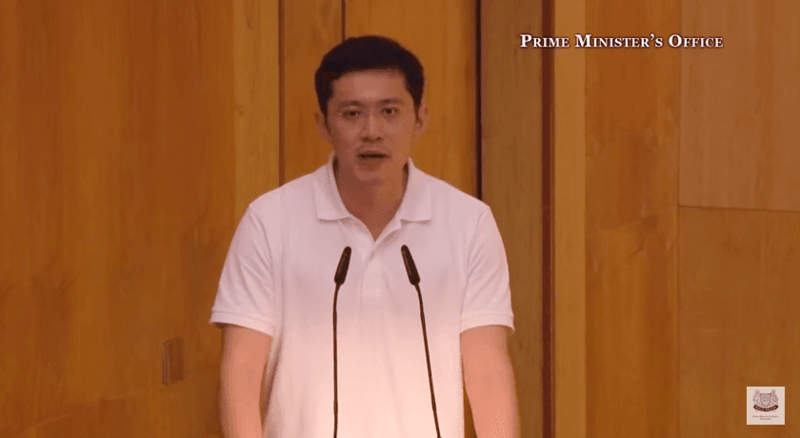 In the videos, the man, who had offered and given Mr Li a ride, was heard asking the 36-year-old repeatedly to confirm his identity, his residential address and the security arrangements for him. The videos were taken without Mr Li’s knowledge or permission, the police said in a statement. The man has been identified and is assisting the police with their investigations. A police report has been made regarding videos taken of Prime Minister Lee Hsien Loong's son, Mr Li Yipeng, who was offered a ride in a private car, said the police in a statement on Sunday (March 17). The car was driven by a 31-year-old Singaporean man, added the police. It is believed the vehicle was not a private-hire car.